What would it be like if the support, encouraging nature, and community spirit of the blogosphere were ever focused on a single blogger? That's where the idea for BLOG BLITZ came from. A few of us have experienced that sort of attention via book launches or other publishing announcements, and still others have achieved that level of awareness through the popular blogfests we host. In most cases there is a lot of work that goes into generating that amount of interest. What I'm talking about is being suddenly thrust into the spotlight, without even lifting a finger. What would it feel like to be the recipient of that kind of exposure? Here’s how it works. Go to my original blog post HERE and sign up on the linky list, making sure to record your email address, and you’ll instantly become a member of the Blog Blitz Team. Then from time to time, I will select a deserving blog (that must be part of the Blitz Team) and a specific date. I will then email the team members that information and on that date we all will go out of our way to visit that blog and leave an encouraging comment on their most recent post. Right now we have 210 people signed up to participate...and growing. By the way, were you aware that I lacked a sense of smell? Weird, huh? Want to see what a BLITZ looks like? PK Hrezo was our first victim, but it just so happens somebody is getting Blitzed today, so if you go HERE you can see first hand what its like. Hope you decide to become a part of the team! Did you realize that I'm holding a contest during the Challenge? No? You can read all about it HERE. Okay DL, rehashing much lol. I think The Blog Blitz os an excellent idea , by the way way there is a certain blog I can't get to if you get my meaning. To be honest, the thought of over 200 people visiting my blog in one day kinda terrifies me! And the man in the back said, "Everyone attack!" and it turned into a Ballroom Blitz! I did my blitzing earlier. What fun! Blog Blitz is proving to be a whole lot of fun, so far. Love your blitz idea. So glad you did it again today. You lack the sense of smell? So I wonder how the taste of food differs for you? I guess you wouldn't know would ya. Interesting. I love this blog blitz idea! I've already visited today's victim, too. Yay! YEAH! I love this idea! And I did BLITZ! Thanks, DL, for such a cool way to celebrate each other! I love the Blitz! It was fun to participate in the first one. I still think you're awesome for coming up with this. Off to contribute to the blitzing! Btw, in case you didn't know, we are the Blitzers. The recipient is the Blitzee. I'm off to blitz right now. I knew a guy who couldn't smell or taste. And yet whenever he has company he insists on cooking for them. It's a bit awkward when the dishes he prepares are sub-palatable. He's quite defensive about it. Got It...(1)joined Blitz Team (2)Blitzed Father Dragon (3)Earned 2nd Entry (4)Kudoed YOU for Letter B.
Yup, being on the Blitz team is fun. It's nice to be able to be part of making someone feel special. Keep those brilliant ideas coming! Blog blitzes are awesome! Thanks DL! Good post, and good luck making the bread!! I love this idea. It's a lot of fun!! c) it uplifts the unsung heroes and unrecognized geniuses who deserve support. I love your theme and I even gave it a shout out on my blog post today. I am so mad at myself, I actually forgot. about it yesterday. I visited your blog and read your theme, but you didn't have your A to Z post up yet and I fell asleep so early last night, I never got back to visit. I will be here for the rest of the month. Smell, huh? I suppose that can be an asset and a liability. I hope that is the information I was suppose to discover. I also checked out your blog blitz and added my name. What a cool and fun idea. You come up with the best ideas for giving back to the blogging community. I am off to check out the first recipient of the blog blitz and today's recipient. You seriously can't smell? Wow, I can't imagine what life would be like. I bet I wouldn't eat as much though. Al was a perfect choice for the Blitz! 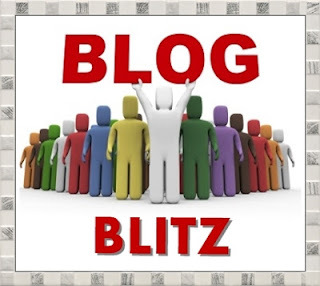 Your blog blitz idea is awesome and I'm really happy to be a part of it! that should be your nickname, blitzen! That's such a great idea, DL!! Love the idea and a great "B"! I love the Blog blitz and the a to z challenge. So exciting to be a part of both! Love this idea! What a great way to give someone an extra nice boost. You mentioned before that you can't smell and I remembered because my husband can't smell, either! Does it effect your taste at all? Sometimes my husband can't pick out subtle flavors, like then I add something extra to a meal. Love the idea of blog blitz. I hope I keep remembering to post on the right day. Great topic for letter B.
I blitzed PK and victim, er, I mean, recipient #2. And had so much fun doing it, too! a pefect article for B! Blog Blitz is such a wonderful idea! I've blitzed very early today. That was fun! You know, you should have saved Contest and Challenge for tomorrow. Now what are you going to do? And the smeller thing...that could'a been S-smell or N-nose. But now you've wasted them. No fair using them now! The blog blitz sounds like a lot of fun. Lacking a sense of smell must be a real handicap for a writer... I feel for you. And I'm still thinking about the time commitment of joining your blog blitz team. I don't usually blog or visit other blogs more than once a week. Your Blog Blitz, true testimony to the ideals of a sharing, caring blogging community. A community where we rejoice in the diversity of an all different, all equal world. Well done, kind sir. And thus, I share you message to the various social network sites. Yep, even 'Farcebook'! Be well and enjoy the A to Z. Your post about this on my blog is still receiving comments, DL. Great job! Very interesting concept - I like it! I think I like the dog pile analogy the most!! Sounds like fun, and a great way to find blogs you might never have run across without it. Glad the blog blitz went well. Nice B! Interesting concept to help people get some attention. What a great idea! I just signed up - can't wait to be part of a blogger dog pile. Lacking a sense of smell is probably something I can remember. Where did you lose it? Did you use a flashlight when you were looking for it? It's an excellent idea. Sometimes that's all it takes to either make someone's day or launch a deserving blog. Fantastic! Sounds like a wonderful concept. Bloggers can be just the best. How exciting! I think I will be signing up for this Blog Blitz. It sounds fun! Have you never had a sense of smell, or did you lose it? One of my sisters hasn't ever had a sense of smell that she can remember. Awesome idea, sounds like fun. I read on another blog that you're sick. I hope you feel better soon! So with no sense of smell does that mean you have keen eagle sight? Ergo the altitude theme in your blog? Just wondering. The Blog Blitz is such a cool idea. Back problems kept me away from the computer, so I was very late in blitzing our latest chosen blogger. I stopped by and left a comment for them today. I 'skimmed' through the comments so I apologize if I'm repeating a question but does the blitzee know when the blitz is going to happen or is it a surprise??? Another fantastic idea though. I'm starting to see how you think, and I like it. What a swell idea. I went back and checked out the original post and really quite enjoy your analogy of the blog blitz being like a fun-filled (albeit cyber) "dog-pile" - yep, I am sure that was entirely politically incorrect as well, but that's what I remember it being referred to.